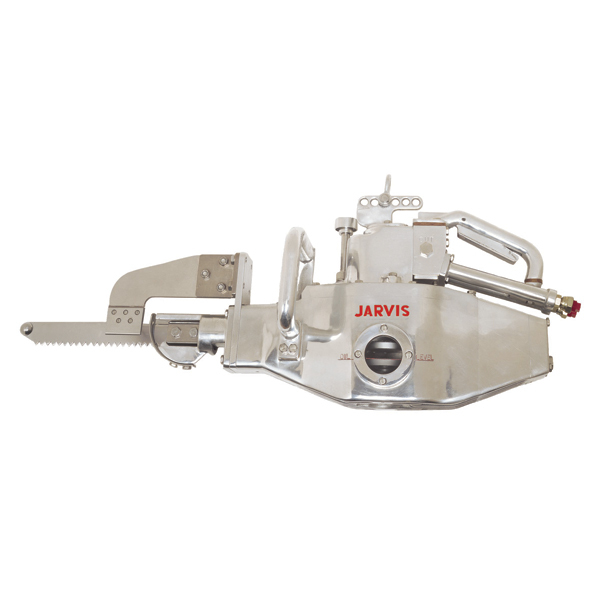 The Jarvis Models MG-1, MG-1HS, MG-1B, MG-1BHS and MG-1BFQ – hydraulic powered brisket saws for beef, hog splitting and forequartering. • The powerful MG-1 cuts through all beef briskets quickly and easily. The high performance MG-1B is even faster, suitable for kills over 200 beef / hour. Models MG-1HS and MG-1BHS are ideal for hog splitting and hog brisket cutting. Model MG-1BFQ is the perfect saw for forequartering. • The MG-1 and MG-1HS cuts fat cattle briskets in 5 seconds, the MG-1B, MG-1BHS and MG-1BFQS in 3 seconds. • Small and maneuverable for optimum handling. • A balanced drive system makes all MG-1 models smooth and quiet for less operator fatigue. • Minimal maintenance due to the oil bath lubricated drive and no electrical components. • Meets international requirements for safety and hygiene.